AVAILABILITY IN CURRENT LITTERS, READY MAY: Ivory-Light Yellow Girl, Ivory Boy, and Fox Red-Dark Yellow Girl & Boy! UPCOMING LITTERS: Charcoal $ Black and "English Cream" Golden Retrievers due May, ready late June-early July. About Forever Labradors … and Goldens too: REAL references! Visit our Facebook Public Page to see what others are saying about our puppies! Our ultimate goal is to offer a quality, family raised puppy that is health tested, well-adapted, superior tempered, and an impressive addition to their forever families! Our puppies ultimately make the ideal family pets, working hunting companions, as well as therapy and service dogs... all without over pricing our pups! We are a family "operation", and are proud to now be raising our fifth generation of Labrador puppies and beginning on our second generation of Goldens!! We continue to raise the standards through our generations of breeding to maintain our standing as an improvement breeder. We are dedicated to the continual improvement of the breed and ultimately the puppies we produce. We maintain a program that consists of extensive health testing, titled pedigrees, supreme dispositions, and an exceptional appearance. Our combined families (mother, son, and daughters) maintain a comprehensive breeding program designed to improve the breed, ultimately providing superior Labrador & Golden Retriever puppies. Aside from health, we breed for the ideal temperament. We now have over 20 combined acres for our dogs to provide extensive room to exercise and play! I have been a small breeder for over 25 yrs. and I do not/will not run a "kennel" type of operation; no cages, kennels, or crates!! Our dogs are raised in our homes and are significant members of our families. Our retired dogs are not placed elsewhere, they, as well as all of our breeding dogs and their puppies, are our spoiled family companions that we treasure. This is not our source of incomes as RESPONSIBLE breeding brings significant time and dedication, major expenditures, both emotional and monetary, as well as pride, accomplishment, and joy to what our babies offer others—definitely not a steady paycheck!! Our puppies are highly socialized in our home with children, cats, birds, and other dogs. I am home full-time as I am extremely dedicated to my fur kids and the future of their babies! Ultimately, we offer a considerable amount of daily interaction with our puppies as they are born and raised in our home, and are heavily handled and socialized several times daily. A proud member of the Association of Animal Behavioral Professionals, I continue to apply principles that ensure a confident and secure puppy. We offer scientific proven neurological stimulation with our babies beginning at 3 days old which, aside from the awesome genetics they inherit, assists in laying the foundation toward the remarkable temperaments they possess. I have yet to come across a more consistent nurturing environment to enable a puppy the ideal foundation towards their lives with their forever family, and I believe our past adopters will agree. We far exceed any “standards” put in place by registering agencies, the Labrador Retriever Club (LRC) and the Golden Retriever Club of America (GRCA) as we DNA genetic test for everything available to the private individual. Accordingly, all of our puppies come with a written contract outlining our immediate money back health guarantee, a LIFETIME GUARANTEE that the puppy will be free of 17 genetic diseases Labradors are prone to, 8 genetic disease Goldens are prone to, as well as hips and an additional eye guarantee. In addition, puppies are wormed 3 times (one of which is a 5-day precautionary regimen for giardia and other parasites puppies are most susceptible to) and vaccinated twice prior to leaving. Our fees assist in our time and commitment to your puppy, the support of all of our dogs; including a high quality balanced diet, supplements, vet examinations, routine wormings, vaccinations, microchips, emergencies that arise, and the amenities spoiled and loved companions require! 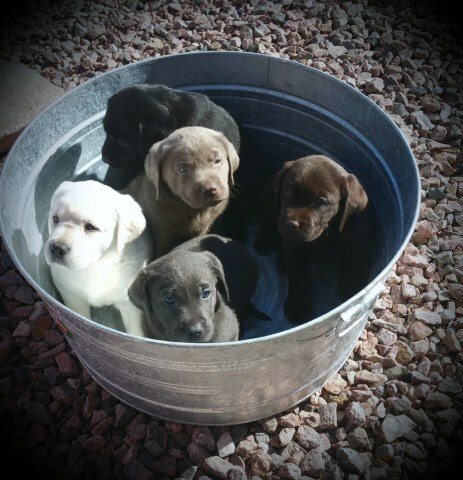 Puppies are priced for LIMITED REGISTRATION status as follows as we place our babies in pet/hunting/therapy/companion homes ONLY: With MICROCHIP $1075 (Black, Yellow), $1175 (Chocolate) and $1275 (Ivory-Light Yellow, Fox Red-Dark Yellow, Silver, Charcoal, Champagne). Most litters are placed within days of being born as we compile waiting lists and secure positions in advance of litter arrivals. A $275 deposit will guarantee a future position! Our dogs are DNA tested and many carry a dilution gene that is the genetic basis in obtaining the colors of silver, charcoal, and champagne. They are registered under their base coat color: Silver=Chocolate, Charcoal=Black, and Champagne=Yellow. Please feel free to look at our Facebook page postings by others and reviews and PM or email us through Facebook regarding planned future litters. Phone number supplied via request.Please note under NO circumstance do we sell to brokers or pet stores! !